As we mentioned above, Square is comprised of a point of sale app, which is available for free in the app store, and the Square card reader. See our video below on using Square. 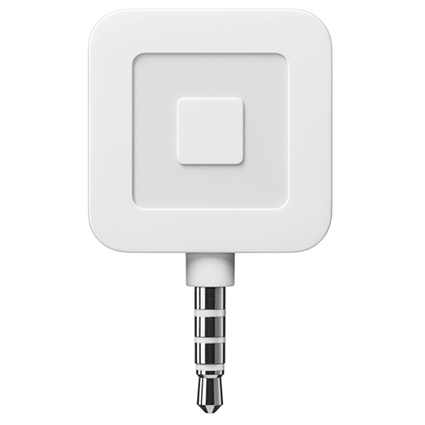 The Square card reader is what comes to mind when most people think about Square. It's the small, white square that plugs into the headphone jack of your device. There are multiple versions of the Square card reader that are now available: the traditional magnetic stripe card reader, an EMV chip and magnetic stripe card reader, or an additional NFC payment reader (for tap and go payments like Apple Pay). All of these options are available from Square's website. 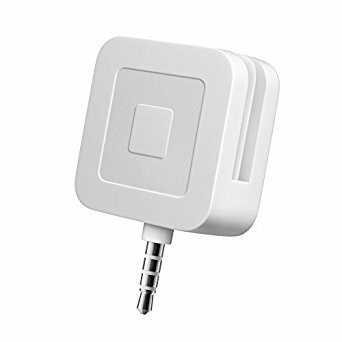 The standard Square card reader is free with sign up from Square's website (though it can take up to 10 days to receive it) or available for purchase for $10 from many retail locations such as Walmart, Target, and Best Buy, and includes a $10 rebate. See Where to Buy Square for locations. 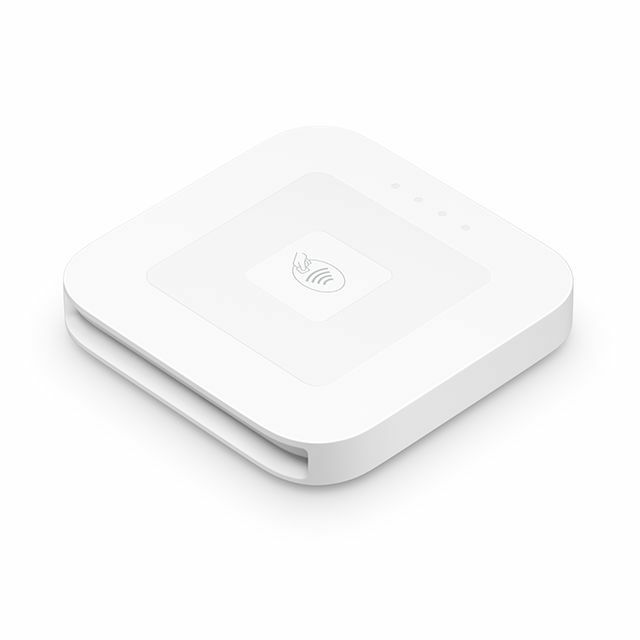 Square also has the option to use the Square Stand instead of the Square card reader. Unsure about whether you should use the Square Stand or a Square card reader for your business? See our Square Stand vs. Square Card Reader comparison. Square is priced at 2.75% per card swipe (and 3.5% + 15 cents per manually entered transaction), which is comparable to similar point of sale apps, like PayPal Here. See Square's website for more details. Compatible iOS Devices: iPad and iPhone (or iPod Touch) running iOS 9.0 or later. See Square's Compatibility Configuration for more information on whether your device is compatible. Square for iPad is compatible with Bluetooth or Ethernet interface receipt printers, printer driven cash drawers (that are compatible with your receipt printer), and Bluetooth interface barcode scanners. For easy-to-use hardware kits, see our Square In-A-Box Basic Kit or Square In-A-Box Premium Kit. Below is the list of recommended hardware for Square for iPad. For more information on compatibility, please give us a call! Thermal printers print by using heat on special, heat-sensitive paper. They print quickly and quietly, and are best for nearly all receipt printing situations. Ethernet Printers: Ethernet receipt printers plug into to your router in order to connect with your iPad. Your iPad must be connected to the same network as the router. Bluetooth Printers: Bluetooth receipt printers connect via Bluetooth to your iPad. The mobile Bluetooth printers are battery powered for mobility. For more information on using and pairing a mobile Bluetooth printer, see our video on using a mobile printer with Square. To enable printing to your receipt printer from Square, you first need to connect your receipt printer to your iPad. In Square, go to Settings > Printers, tap "Create New Printer Station" and follow the instructions to connect your receipt printer. Once it's connected, make sure "Receipts, Bills, and Reports" (under Print From This Device) is toggled on. This screen is also where you can enable printing kitchen tickets (if you have a kitchen printer). Please keep in mind that mobile Bluetooth printers (such as the SM-S220i or SM-T300i) cannot connect with printer driven cash drawers. Mobile printers can only be used with manual cash drawers. There are a number of accessories that work Square for iOS beyond what's on their officially compatible list. Please keep in mind that although we have tested the following hardware and found that it works, Square will not support it should you run into difficulties. The only receipt printers that Square recognizes are certain Star Micronics and Epson brand receipt printers, so the majority of receipt printers that work with Square are listed above. If you have the older TSP100 (which has since been replaced by the TSP100III) with an Ethernet interface, you can use that with Square. Please keep in mind that mobile Bluetooth printers can only be used with manual cash drawers, and not printer driven ones. In addition, manual cash drawers will always work with any iPad set up. Square primarily works with the Socket CHS 7Ci scanner, although it will also work with the Socket CHS 7Qi (2D barcode scanner) or other Socket CHS imagers (7Xi, 7XiRx). The Socket scanner must be an imager to connect with Square properly. See our bluetooth barcode scanner comparison for more information.